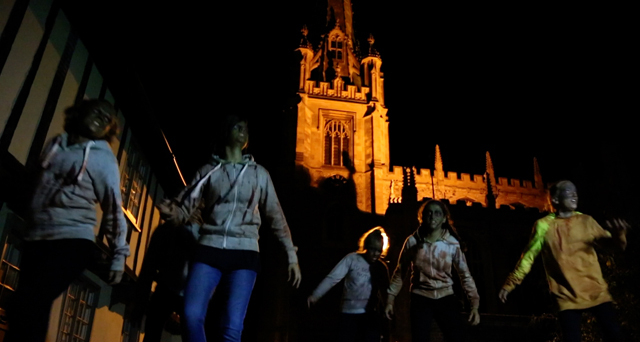 Zombies are infiltrating Saffron Screen with the premiere of locally made film Zombie Occupation on Saturday 3rd November. The film, directed by Creative Walden’s Paul Bellany, includes 100 local young people and was funded by the National Lottery. There is blood, gore, disappearances and evil rituals and with adults reluctant to recognise the danger at the door, it falls to a band of courageous teenagers, armed with a wooden cross, a potato peeler and some holy water, to save the day. Can they outsmart the army of zombies descending on the town, hell-bent on murdering the Queen on her royal visit to Saffron Walden? Shown with a documentary about the making of the film.